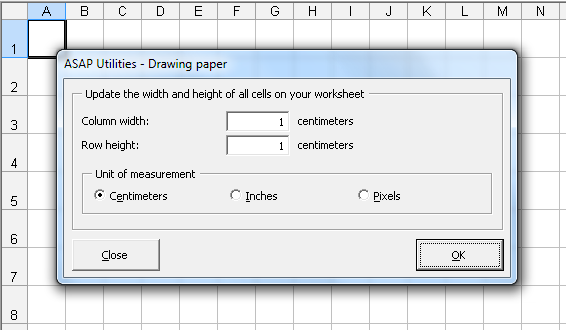 This tool allows you to specify the column width and row height of your cells in centimeters, inches or pixels. This is helpful if you use the Excel for drawing purposes, such as creating a flowchart or when you design your garden or need to create a floor plan. It can also be handy for quickly creating square cells. This tool will launch Excel's "save as�" dialog and uses the value of the first filled cell on your worksheet as the suggested filename. The setup is now translated into Dutch, German, Spanish and French too. Your last used settings will now be remembered. If you choose to autofit/resize all comments, the utility used to use a maximum width of 300 so that you could read the contents without horizontal scrolling. You can now specify your own maximum width. This can be useful if you have a wider screen and when the comment contains many line-breaks. The design is improved and it now also remembers the last started utility. This is useful when you have a nested formula. 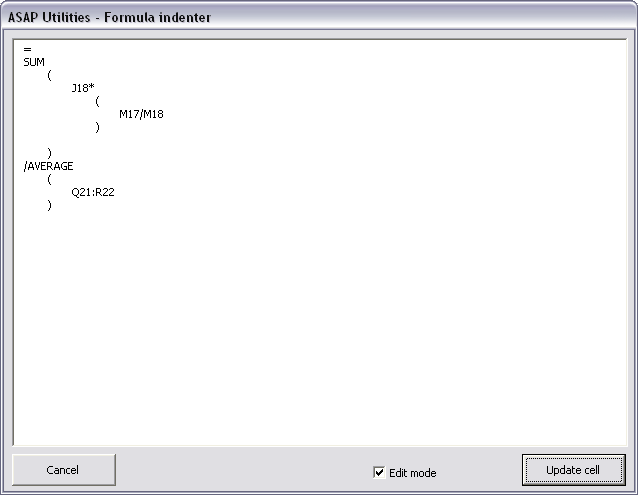 It shows the indented structure of your formula. This way you can more easily see if the brackets are placed properly. You can also edit the formula. This will put the path and filename of your current workbook to the clipboard. You can then paste it into another application. This can for example be useful if you're working on a file and want to inform a collegue and tell him/her in an email where he/she can find the file. With this tool you can make spaces, tabs and linebreaks visible. This can be useful because sometimes characters such as these mess up your lookup formulas. This tool changes your data when you choose "Show" but you can quickly switch back to the original when you choose "Hide". Basically the method is quite simple. It replaces spaces, tabs and line-breaks with a unique character. Then the "Hide" option changes these special characters back to spaces, tabs or linebreaks again. Unfortunately it is not possible to make it work without changing the values like the hide/show formatting marks in MS Word. However we think that this tool is a useful alternative. Improved speed. Furthermore, if you have hidden rows at the end of your data, they now remain hidden. The amount of files listed is now a worksheet formula. This has the benefit that when you use the autofilter to narrow down the list it amount of files listed is updated and it shows only the number of files displayed by the filter. 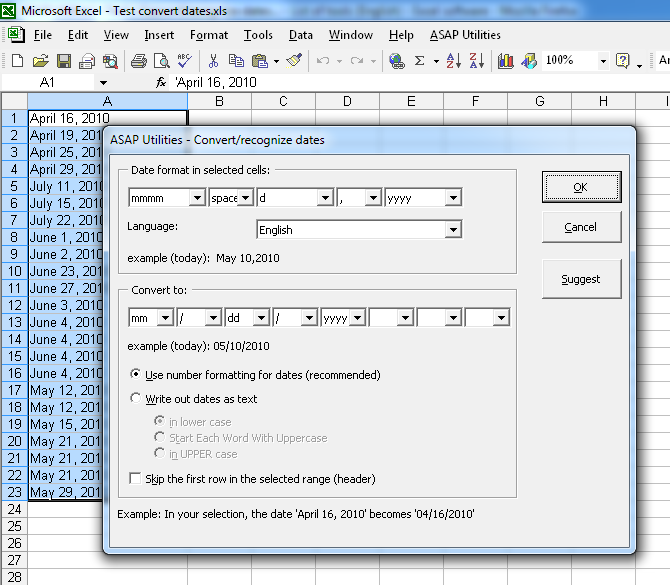 The utility can now also convert dates where the month is written as text. 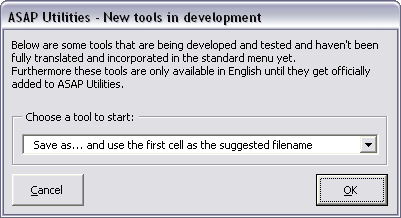 This means that if someone has entered for example "January 3, 2008" in a cell that this tool can convert it to a proper Excel date. You can then use it for example in your calculations or have the dates sorted properly. 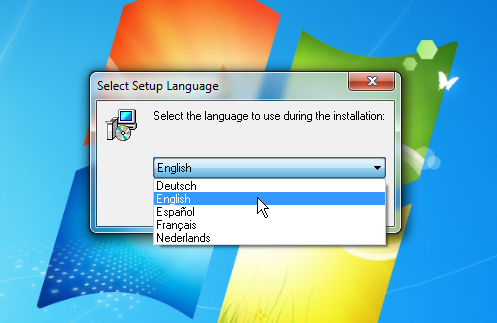 The utility recognizes the months written out in the language you have specified for the dates in Windows (Regional Settings), and it regognizes the languages English, Dutch, German, Spanish and French. 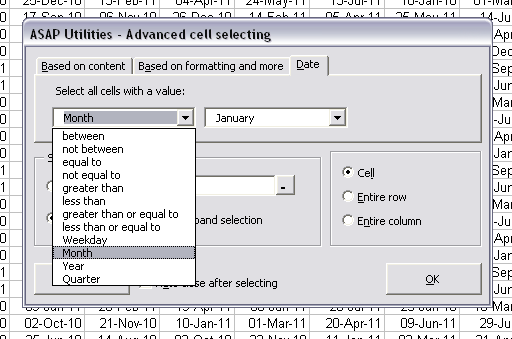 We've added the option to choose between the cell's value, formula or displayed value (formatted text). 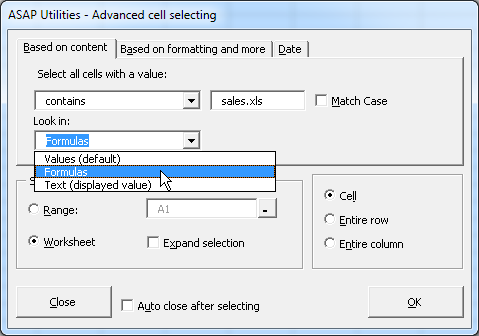 This way you can for example select all cells with a formula that references to a certain file or sheet, uses a certain range name, etc., etc.. Improved speed for some files when they are exported in a separated text format. The following tools were updated to better distinguish the large amount of colors that are available starting from Excel version 2007. 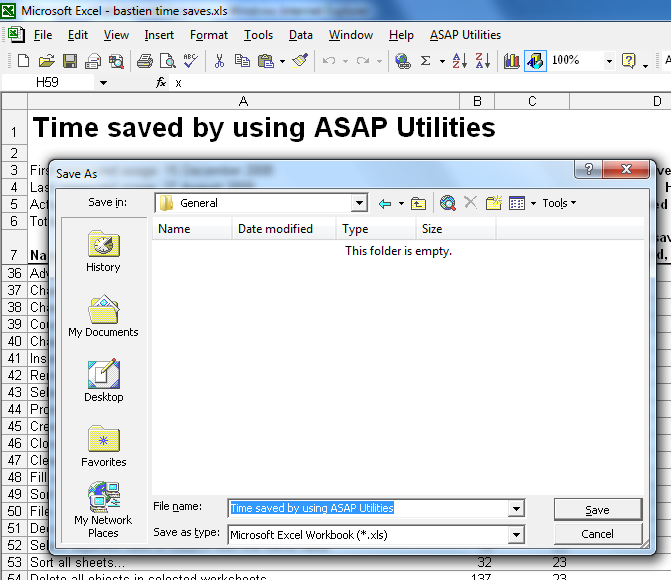 In a non-English version of the pre-release of Excel 2010, the browse-for-folder technique in ASAP Utilities produced an error. This is now fixed. Fixed the bug where ASAP Utilities thought incorrect there weren't enough rows available (-2) to report the files. If you added this tool to your favorites&shortcuts menu and assigned a shortcut to it, then that shortcut didn't work. When you clicked on it in the menu it worked correct but when you used the shortcut for this to you got an error "the macro cannot be found". This is now fixed. 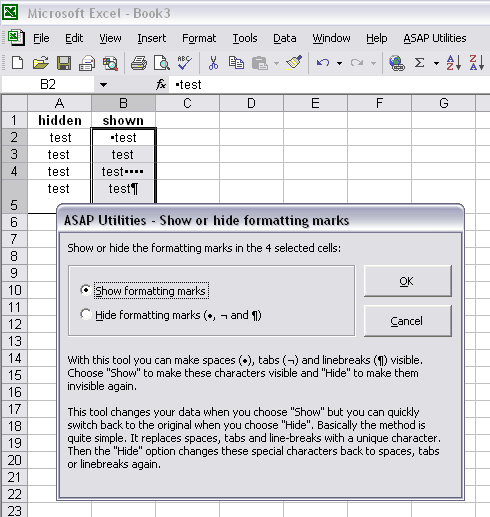 In Excel 2000, 2002/XP and 2003: If you choose to export the sheets as Excel files, cells with more than 255 characters were truncated to 255 characters. This is now fixed. This problem did not occur in Excel 2007 and 2010. 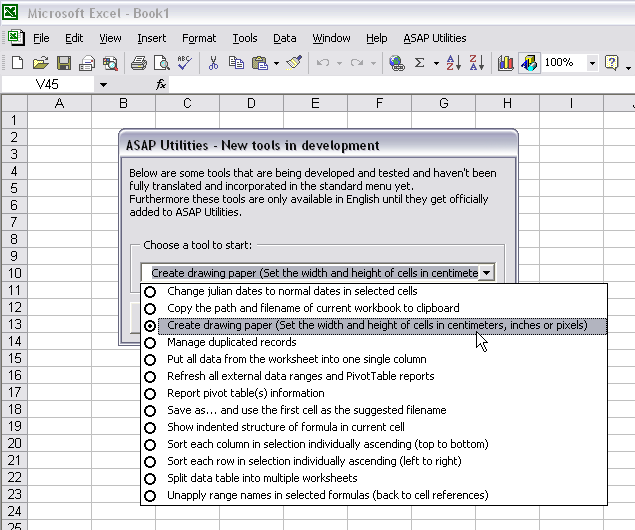 In Excel 2000, 2002/XP or 2003: If you choose to export the sheets as Excel files, cells with more than 255 characters were truncated to the first 255 characters. This is now fixed. This problem did not occur in Excel 2007 and 2010.